That is a nice picture and I like the texture on the second one. 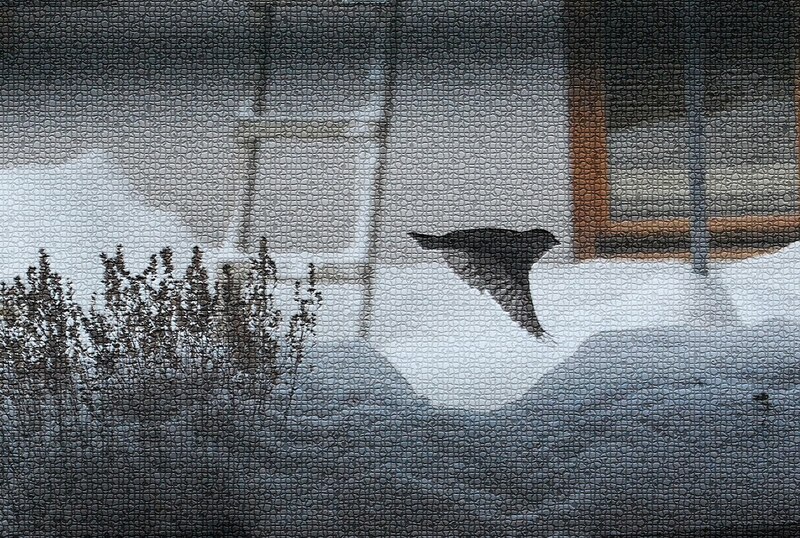 So much snow, life must be difficoult for little birds. I like how you caught him in mid-flight. Karsno si je uhvatila u letu, odlična fotka! Tekstura je super, sviđa mi se! Great shot. I love the effecton the second photo. Looks like a beautiful Matt finish. Draga Meda svaki puta se iznova divim vašim slikama,prekrasan prizor ptice u letu..veliki pozdrav! Koji je to veličanstveni trenutak!Predivna slika!I onda još kao da je prenjeta na platno....fenomenalno! It wasn't easy,for the light and for the movement. Stunning capture of the bird in flight. I like the texture of the second one too. Pokret zaustavljen u prostoru i vremenu, divno. i saw you on my side bar and realized it has been months since i heard from you. just wanted to say hello and that I hope all is well with you and your family. Hi Meda, time always flies and I have not been at your place for a while. I hope all is well with you. Perhaps you have just a break or you might be travelling around the world! Best wishes.T. I miss your blog shares! Hey wait for second click, don't fly. Beautifully captured.